Put Formula-1 based engineering in your M50 powered BMW! Why should you use VAC High Performance BMW Valve Springs for your advantage? We use them ourselves! Installed thousands of race engines, and street engines for years with nothing but excellent results! Why are these springs the best? Designed with the aid of a Formula-1 engineer! Made from H-11 Alloy. This metal is often used for highly stressed structural parts such as aircraft landing gear and still offers resistance to thermal fatigue. Shot-peened for stress relief and dual-interference fit to control harmonic resonance across the rev range. Dual-Spring Interference configuration offers the advantage if should something happen to one spring, the other can prevent the valve from dropping and causing catastrophic engine damage. Use our VAC High Performance BMW Valve Spring Set to extract the most from your high performance build! 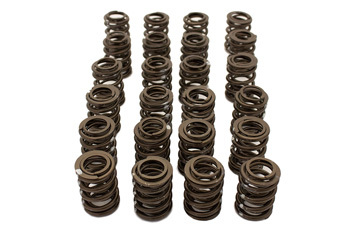 With experienced engineering, these springs are guaranteed to out perform the competitions valve springs at any price.